When is it the Right Time to Buy the Right Tool? 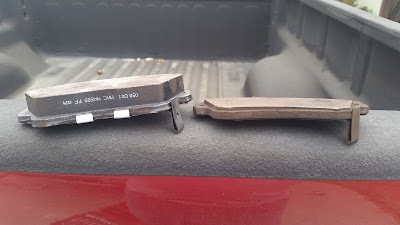 Recently I had the experience of changing my own front brake pads again on my runabout, the 2007 PT Cruiser. 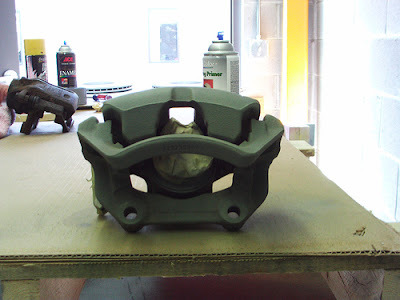 A typical caliper for disc brakes. In the last couple of years, my schedule has been busy enough where it's been easier to take it to the shop, and pay someone else to do it. But I decided to do it myself this particular day, because I missed that certain Zen I get when I work with my hands. The steps to change brake pads isn't a hard one. It's a matter of jacking up the car, taking a tire off, removing the caliper, swapping the brake pads, and reversing the steps. You can find the basic steps here. But there's always one step that makes it a little tricky. The calipers, which press the pads against the rotor to slow the car, are extended because the old pads are worn down. One of my old pads vs the new. You can say I got my money's worth! That means that getting the new pads to fit around the rotors, which means compressing the caliper piston, which means using a tool, improvised or otherwise. 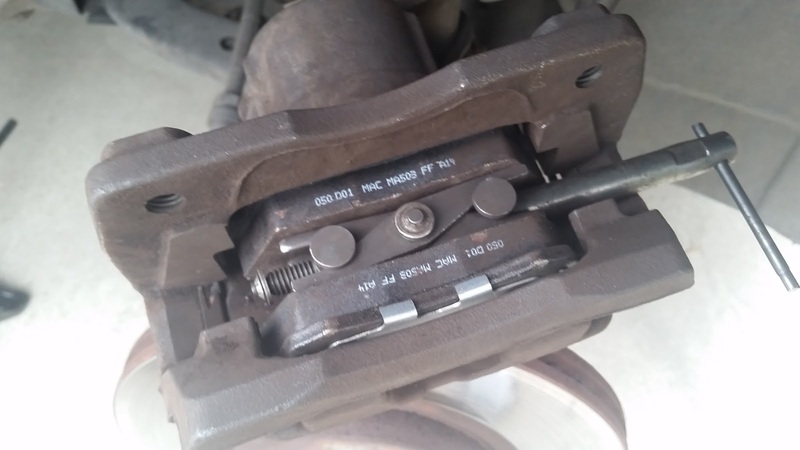 Many years ago, when I was a broke college student and would spend hours working on my own car, I would wrangle a the calipers open using a combination wrench or a screwdriver as a pry bar. This usually included a lot of grumbling as I balanced the caliper in my hand an tried to get leverage with whatever improvised tool I was using. One day, I was having one of those "garage conversations" with an old mechanic laughing about opening calipers. He reached into his toolbox and said "buy one of these". And showed me a caliper opener. I bought one that same day. Although there different styles for this tool, the one I purchased nearly twenty years ago uses a screw and scissor mechanism. Not unlike the scissor jacks included with most modern cars. By twisting the screw, the scissors open, and the caliper piston compresses. It has reduced both the time, and aggravation of getting the calipers open. You may have guessed that the moral of my story is "have the right tool for the job". As a matter of fact, I've written a post on a very similar vein before. But that's not always part of it. Many times, there always a "better tool". But in order to enjoy the savings of the tool, you have to spend the money on the tool. I'm sure there are a few of you who are thinking, "that tool is a waste of money, an improvised pry bar will work just fine!" Are they wrong? I don't think they are. It's a choice they've made based on their own unique experience. The other question? Is there enough benefit to having that tool to justify the investment? That's the big question that has to be answered. Depending on your tool, ROI calculators may be available, but do they tell the entire story. Some other things that might be worth considering. How often will you use the tool? Are you going to use the tool every day? Every few months? Or "Who knows when the next time will be?" The more use you get out of the tool, the better off you'll be. How much time does it save? If it's saving you 5 minutes every 2 years, and costs thousands of dollars, it's not as wise of an investment as something that costs a few hundred dollars and saves thirty minutes every few weeks. How much frustration does it save you? Are you, or one of your coworkers cursing a blue streak while trying to "make it work"? Someone who's frustrated can make other costly mistakes. That frustration can even seep into other projects. There's never time to do it right, but there's always time to do it twice! In other words, how much does it cost *not* to have the right tool? Are you scrapping parts because it takes more than one try to do what the right tool could do once? Scrap costs money too. The right tool can turn a frustrating job into a "cakewalk", But at the same time, buying a tool "to have it" can get expensive quickly. 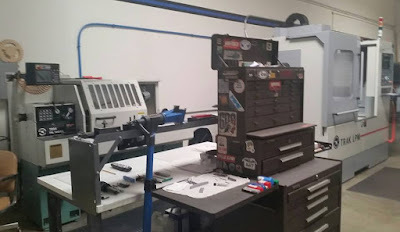 Whether it's a caliper opener costing 15 US Dollars, a CNC machine costing 100,000 US Dollars, or a CAD Program costing 10,000 US Dollars, it's not always a simple decision. make more than it cost to make its purchase worth while. That's where consideration, analysis, and a large dose of experience have to combined to decide when the time is right to make that investment. A Visit to Westec 2015!